Crafted from 4oz traditionally vegetable-tanned Tuscan leather, our A5 Notebooks blend style with functional design. Features a card pocket in the front cover and the back flap allows full functionality of the elastic strap. Each notebook is meticulously and skillfully made to order, using a mix of traditional manufacturing and modern personalisation techniques. Normal wear and tear ages each piece with a unique patina to create a distinctive timeless character. Personalization is free. To have your notebook personalised with your initials, name, or custom text, select a font from the drop-down menu and add your custom text in the box provided. Should you wish to submit your own Logo or Artwork, place the order and email us the image file along with your order number here. 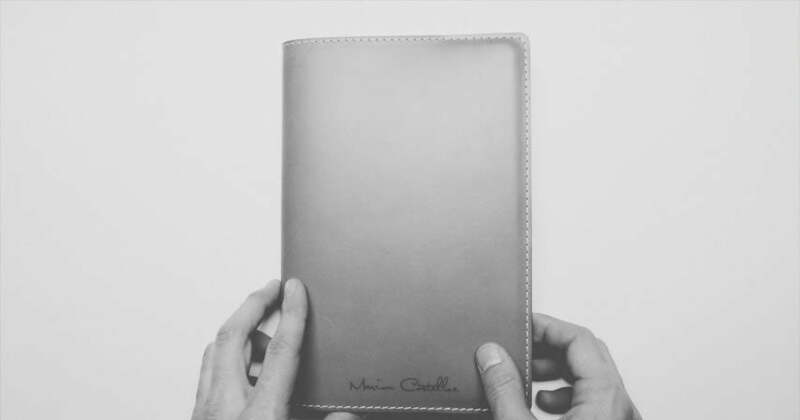 The leather cover comes with a removable soft feel A5 notebook which has 160 pages of 90gsm luxury lined ivory paper, a fold pocket in the back cover, a marker ribbon, and a handy elasticated strap. Our notebooks are designed to accommodate most standard A5 refills / journals. Additional refills are available right here.